"The February 2010 Daring Bakers’ challenge was hosted by Aparna of My Diverse Kitchen and Deeba of Passionate About Baking. They chose Tiramisu as the challenge for the month. Their challenge recipe is based on recipes from The Washington Post, Cordon Bleu at Home and Baking Obsession. " I've noticed another consistent theme, at least in my own personal challenge results: The cream is always the best part**. And the cream in this Tiramisu seriously rocked. You make your own homemade marscapone cheese. You make zabaglione. You make vanilla pastry creme. You whip heavy cream. You fold them all together. You have seriously made some of the best tasting stuff on earth. My homemade ladyfingers were pretty, but dry. Scared off by instructions that had me petrified of disintegrating pastry, I failed to soak them long enough to get the hit of coffee and liquor that makes this such a wonderful dessert when done right. But it didn't matter, because I could just eat around that part to get more of the cream. Or better yet, just skip the formalities all together. Per Monty Python***, I am now among the blessed. You can be blessed, too, or get it already made at Trader Joe's. Bring 1 inch of water to a boil in a large pot. Reduce the heat to medium-low so the water is barely simmering. Pour the cream into a medium metal mixing bowl, then place the bowl over the simmering water to form a double boiler. Heat the cream, stirring often, to 180 F. If you do not have a thermometer, wait until small bubbles keep trying to push up to the surface. It will take about 15-20 minutes of delicate heating. Add the lemon juice and continue heating the mixture, stirring gently, until the cream curdles. You won't see a separating of curds. All that the whipping cream will do is become very thick, with a few streaks of whey when you stir. It's done when it covers the back of a wooden spoon thickly. Remove the bowl from the water and let cool for about 20 minutes. Again with the double boiler. Heat water in a large pot. (See the whole marscapone set up). In a large metal mixing bowl, mix together the egg yolks, sugar, the Marsala (or espresso/ coffee), vanilla extract and lemon zest. Whisk together until the yolks are fully blended and the mixture looks smooth. Place your bowl over the pan/ pot with simmering water. Cook the egg mixture over low heat, stirring constantly, for about 8 minutes or until it resembles thick custard. It may bubble a bit as it reaches that consistency. Let cool to room temperature. Cover and refrigerate at least 4 hours or overnight, until thoroughly chilled. Still whisking over the stove, but no boiling water needed. Combine all ingredients in a chilled metal mixing bowl. Using electric mixer with chilled beaters, beat until light and fluffy. Step 5: Magnifico! Bravo! Fantastico! Combine 1/3 c. of that marscapone, the zabaglione, and the vanilla cream until smooth. Fold in the whipped cream. Get out your spoon and prepare to be completely blissed out. 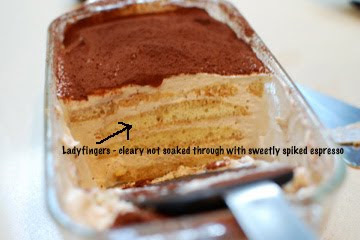 If you have baked up some ladyfingers and mixed some strong coffee with sugar and a splash of liquor, you can now make Tiramisu if you want by soaking said cookies in the coffee mixture for a second or so on each side, and then layering the cookies, the cream, the cookies, the cream, and so forth in a nice dish. Put the whole thing in the fridge overnight, dust with cocoa power and dive in. Personally, I'd recommend skipping the whole ladyfinger thing, slicing some strawberries and spooning a whole bunch of the marscapone cream on top. You can have a cup of coffee (spiked or not) on the side. Multo bene! * Multilayered hungarian torte, French puff pastry cups, French macarons, and Nanaimo bars from Canada. See what I mean? ** Mocha buttercream, braised short ribs with creme fraiche (perhaps stretching the definition of cream, but still), creamy peanut butter filling, and Kahlua cream cheese frosting, respectively. Her: Hey, Mom! Guess what? I have the coolest homework for the Greek study! Me: That's nice, honey. Your dad should be home soon, and I know he'd love to hear all about it. Me: Really, he's great with all those Olympians. He's practically a Greek god himself*. Me: And your brother, despite being barricaded in his room hiding from you right now, I think would be open to bribery if you need any help. I'll even pay. Me: It's...Oh! Well...great! Let's get started! It turns out she's volunteered to make a dish and bring it in to feed the class this week. She pulls a cookbook out of her backpack, a personal loan from her amazing teacher. There are tons of great options to choose from, so we decide to do a test run of a few at home and pick a winner from there. She's all over that plan. Post-it notes are stuck to three recipes, then she and the book disappear and she returns with a detailed shopping list. "Don't forget anything!" she admonishes me when I drop her at school the next day. With a determined look on her face, she takes over the kitchen that evening, demoting me to lamb-cuber, onion-slicer and clean-up crew**. And then, my oh-so-mortal girl proceeded to make a dinner that was fit for the gods. Whatever their wacky names might be. 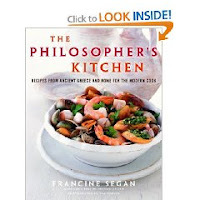 All the recipes she made are from The Philosopher's Kitchen, a fascinating collection of modern interpretations of ancient foods. I've just ordered a copy and can't wait to try more of these recipes when it arrives. This lamb dish was incredible! Simmer the vinegar, raisins, dates and honey in a small saucepan over medium heat until raisins are soft, 2-3 minutes. Allow to cool to room temperature. Puree this mixture, along with the pine nuts and the Parmesan cheese, in a food processor until smooth. Add the mint leaves and pulse until minced. Slowly add the olive oil and continue blending until smooth. Toss the lamb cubes with 1/2 of the pesto in a large bowl. Cover and refrigerate for at least 1 hour, and as long as 12 hours. Season remaining pesto with salt and pepper to taste, cover and refrigerate. Preheat grill or broiler. Liberally sprinkle the lamb with salt and pepper. Evenly divide the lamb cubes between the skewers and grill or broil until the lamb reaches the desired doneness, about 2 minutes per side for medium. Serve with the reserved pesto on the side. Noting selflessly that there are several vegetarians in the class, she's decided to serve these decadent Honey Feta Griddle Cakes to her friends at school. * When we were applying for our first rental house together, we had to meet the agent at his West Hollywood office. When my now-husband, then-boyfriend walked in, the dapper older gentleman representing the owner drew in a breath and said, "You didn't tell me you were bringing Adonnis!" We got the house, and I got a stomach cramp from laughing so hard in the parking lot afterward. ** I could have personally filmed a week's worth of material for Dirty Jobs. Wash and then drain the kale. Very roughly chop it into 2-inch pieces, discarding the tough stems and any stringy looking pieces. In a large saucepan, bring lightly salted water to a boil. Add the kale, and blanch until just tender, about 5 minutes. Drain completely in a colander. * Some of my favorite bitter essayists are David Sedaris, Jen Lancaster, Laurie Notaro, and Angela Nissel. Worthy titles from each: Holidays on Ice, Bitter is the New Black, We Thought You Would be Prettier, and The Broke Diaries. ** My adaptation was, of course, to add the Italian bacon. *** I ate up these intensely flavorful greens with creamy cheesy grits. Virtuous yet self defeating in the same meal. If I was a bitter person, I'd be wryly commenting on this for sure. Hopefully to my acerbic dinner companion over cocktails. Mom was on a roll today*. We were driving home, and she was all abuzz about Tiger Woods' upcoming news conference. After making sure I was aware of the scheduled date, time and format (this Friday, 8 am, a statement lasting 5-7 minutes, no questions), her hopes and dreams for him came pouring out. Me: Are you really going to watch that, Mom? Her: Oh yes! Everyone will. Oprah's going to be watching, too. Before all this mess, Oprah said he was the son she never had**. You just know she's been crushed. We all have. Her: You know what I mean. It's just so sad to see that family falling apart. The kids are so little! I've been hoping and praying for them to stay together. Me: But he's completely abused the whole notion of what it means to be a husband and a father! Her: I know, I know. But guess what? Her: He bought her a yacht. Me: He bought her a yacht? Her: Yes. That's such a good sign. Me: A sign of what? Her: For the marriage! That they're communicating! He had to at least talk to her enough to know where to send it, right? Her: It's a start anyway. * Her other observation was about how nice it was that Hillary didn't leave Bill, so that when he had his heart attack the other day, Chelsea didn't have to choose between her parents and they could all just visit each other as a family. ** True story. The episode aired in 2002. Angelina has apparently told CNN that "it is not the right time for Haitian adoptions". I, on the other hand, have an open box of Entenmann's Cinnamon Donuts Pop 'ems on the front seat of my car. Score: Angelina - 1, Me - 0. "Brad and Angelina are not splitting up. It was all a terrible rumor. * In fact, they're going to sue all those tabloids about it. Now everyone's talking about them maybe adopting an orphan from Haiti. Brad says they have enough children, but she's down there helping out from the earthquake, so you never know. " She takes a sip of her ginger ale. "They already donated a million dollars, but I guess for her, going to poor countries after a disaster is like other people going to the grocery store hungry." * Which she had repeated to me last week with a despairing shake of her head. Mom had been hoping against hope their relationship could be saved, but when he spent millions on a house to supposedly escape his family, it was clearly a lost cause. Real estate, to Mom, speaks volumes about relationships. ...the Foodie Girls are back. The carpool from the Valley had just exited the 10 freeway and headed north on Normandie when FG10's cell phone rang. A quavering voice came over the line. FG6: Where are you guys? I'm here alone. Us: (reassuringly) According the the GPS, we're about 5 minutes away. We hang up, and as the nice computer lady in my car is saying, "your destination is ahead, on the right", the reason for the slight edge of panic in FG6's voice is apparent. The block is full of graffiti covered aluminum siding, some bodegas with florescent colored pinatas hanging from the rafters, and a lot of iron fences with barbed wire on top. It's bleak out here, despite the large imposing Greek Orthodox church across the street*. But the minute we swing open the door to Papa Cristo's, all thoughts of tire irons and my car windows disappear. We have literally stepped into sunshine. Blue and white checked oilcloth-covered tables fill a spacious open room. Climbing pots of cheerful flowers are scattered about, along with businessmen, families, nurses in uniform, and couples in jeans. The door chimes as two policemen pick up takeout, and are greeted heartily by the staff. Everyone is smiling. It's so contagious that we, too, are grinning as we take in the market in the center of the space, with shelves of glistening green olive oil, stacks of honey, briny tubs of olives and wheels of exotic, flavorful cheeses. Bottles of ouzo are lined up behind the counter, and a cheerful woman is placing pieces of baklava bursting with walnuts into a pink box for a customer. With great restraint, we go by the glass case full of bakery treats and take in the vast and colorful menu. Everything sounds good to us, and the smell is intoxicating. We step up and order, one by one, and the lovely man behind the counter beams at us. "You are getting all of our best things!" he says proudly. "Are you sure you've never been here before?" Everyone in line around us laughs. How much do we love this place? We sit at a table by the window, and the food starts to arrive. A sizzling cast iron skillet holds a block of tangy feta cheese, plump red tomatoes, and a scattering of herbs in a slick of hot olive oil. Warm fluffy pita bread to scoop up every scrumptious bite. Flaky filo triangles bursting with spinach and cheese. Plump shrimp basking in a zesty tomato sauce. Salty lamb gyro slices generously layered over feta and tomatoes on more of that yummy pita bread, completely redefining the idea of pizza. A platter bursting with kebabs of chicken and tender beef. We are literally groaning with happiness. Who cares if the Greek salad is just OK or if the chicken kebab is not quite as memorable as the rest? Everything else is out of this world! A portly man with close-cropped gray hair appears at the table to clear the plates and ask if we have room for dessert. As one, we begin babbling and pointing, almost incoherently at a poster on the wall showing a pile of glistening dough balls. The only label is a very long word with an L and a slew of vowels. We want the honey puffs! We want the honey puffs! He indulgently insists he knows what we mean, counts the hands raised for coffee, and leaves. Soon he is back with a plate of assorted pastries and a pitcher of incredibly strong Greek espresso. We try to mask our disappointment, and point longingly at the puffs. He just smiles and gestures for us to enjoy the coffee. A few minutes later, practically the entire staff has surrounded us, all singing "Happy Birthday" to me**. They come bearing a custard cupcake with candle, a free lottery ticket, and a coupon for $5 off in the store***. We have only barely recovered from this bout of goodwill, when the puffs arrive. And they are heaven. Piping hot, crispy on the outside, pillowy with yeast on the inside, perfectly sweetened with Greek honey, powdered sugar and a dusting of pistachios. Yum! "If I didn't already have a husband, I'd marry Papa Cristo and be Mama Cristo." FG Final Verdict: Papa Cristo's is ON the list - Way up near the top! * According to FG3, who has been here before, this place is completely jammed on Sundays after services. No wonder! **It is not my birthday, but our gentleman friend had asked each of us when our birthday was, and mine, eight weeks away, was the closest. *** Mom would love this! I used my coupon that very day to bring home some delicious fruity olive oil and a block of feta cheese. Now all I need is that cast iron skillet and I'm good to go! The small crowd is breaking up, gathering serving dishes and leftovers to go, hugging good-bye, saying "Thanks so much" and "See you soon!" We wave cheerfully, collect the sticky cans and plates with pizza crusts and soggy chips, rinse glasses, and chat with a straggler mom who's come to take the last two boys. My husband settles down on the couch with the paper, and I stack the last items in the dishwasher and squeeze the soap in with a satisfying "splorp." My daughter and a friend walk in a few minutes later, breathless and smiling from playing outside in the dark. Visiting child: Hey,where are my parents? Missing mom: So, what'd we forget? Me: Seriously. She's right here. Missing mom: (clearly yelling to husband elsewhere in their house) Honey! Me: We'll be happy to keep her, honestly. She's practically one of the family anyway. Missing mom: I'll be right there. I turn to the visiting child. Me: You do understand what you've got here, right? Visiting child: (grinning from ear to ear). Yep! The dishwasher hums as we turn on Sponge Bob, sit back and wait. Mom and I were chatting about the just-announced Oscar nominations. Running through the list of Best Picture candidates*, we hit Up in the Air. Both of us felt that it was good, but nowhere near the best movie of the year. And we both agreed that George Clooney had done much better work in Michael Clayton and Good Night, and Good Luck. But his performance, for Mom, was beside the point. Mom: I think he had a catharsis in that movie. Mom: Yes. Because right after that, he suddenly got serious about his girlfriend, and introduced her to his mother. He's never done that before, believe me! But I think when he walked into that empty apartment, as that character who was so alone, it just hit him. Me: Hit him how, exactly? Mom: He understands now that he needs to be part of something, to have a family. I'm telling you, playing that guy woke him up. And even if he doesn't win the Academy Award, that makes it a great movie in my book. I'm just so happy for him, after all these years. Avatar - 3D upsets her stomach, not going to see it. Hurt Locker - Tough story, very well done. Up - Loves this movie, because it does a great job showing old people. Precious - Can't bear to go. Hopes it wins something. Inglorious Basterds - No interest. Looks vile. The Blind Side - Movie of the week material. District 9 - She's not a sci-fi apartheid person. An Educaction - Hasn't come to her theater yet, but sounds interesting. A Serious Man - Is that the gay one or the Jewish one? It's confusing.